China’s second largest exhibitor Dadi Cinemas has acquired the cinema operation of Orange Sky Golden Harvest (OSGH) in China in a deal worth CNY ¥3.387 billion (USD $492 million) divided into three transaction segments. The move is a serious challenge to China’s market leader Wanda and a boost for Dadi investors Huayi Brothers and Alibaba Pictures. OSGH has 76 multiplexes with 531 screens across 36 cities, with attendance of 24.6 million and BO of CNY ¥808 million (USD $117 million) last year. 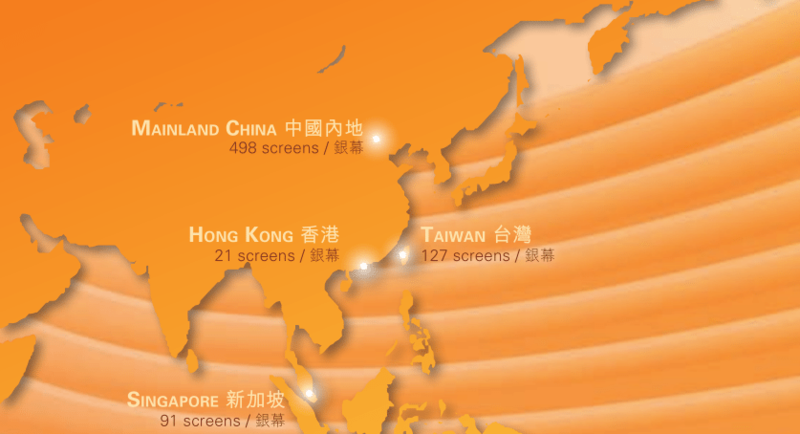 OSGH operates cinemas across Asia in Hong Kong SAR, Taiwan and Singapore (see map below). It was also one of the first operators to establish a multiplex business in mainland China. Dad’s sees OSGH’s Mainland network as a good fit given it presence in Tier 2 cities (Guangshen, Wuhan, Changsha, Xining and others), as well as enabling operational efficiencies. Upon completion it will give Dadi 426 cinemas with 2,442 screens across China. While this pushes Dadi close to Wanda’s screen count, there is a larger gap in terms of Wanda’s lead on BO takings due to its cinemas locations in premium malls and with heavy emphasis on Imax and premium screens. The move comes just days after Dadi’s largest domestic rival Wanda acquired Nordic Cinema Group, via its AMC subsidiary for USD $929 million. OSGH will maintain and continue operating its cinemas outside of mainland China. The company’s has had a shaky financial performance recently and selling off its China assets will give it financial breathing space. The move could kick off further integration in the Chinese cinema market in 2017. While not as well known as Wanda outside of China, Dadi is the fastest growing cinema chain in China, having gone from eighth to second spot in just six years under General Manager Ms Yu Xin, while also attracting investment from Huayi Brothers and Alibaba Pictures. These investments have become a war chest that are enabling Dadi to grow non-organically in its home market, while Wanda is busy abroad. Trading in OSGH parent company shares was suspended on the Hong Kong Stock exchange prior to the announcement.